Within the past year, ExponentHR implemented several initiatives in our strategic marketing roadmap. We relaunched the brand beginning in Q4 of 2017, supported by an extensive integrated marketing plan. The visual identity, messaging, and a complete re-envisioned online experience were revealed earlier this year. Later this summer, we’ll introduce our new on-boarding functionality and enhanced platform experience. We’re excited to announce that ExponentHR will deliver our first Analyst Summit in the second quarter. The event will be hosted in beautiful Sun Valley, Idaho at the Lacerte Mountain Retreat from June 21-23. Leading HCM analysts are invited to attend as we share our HCM technology and the business approach that has propelled ExponentHR for over 40 years. Guest speakers include long-time clients and partners, Tom Walker (Dallas Cowboys), Paul Adams (Bubbl), Laurie Brashear (Avenue 5 Residential), and Anders Farrugia (iCIMS). 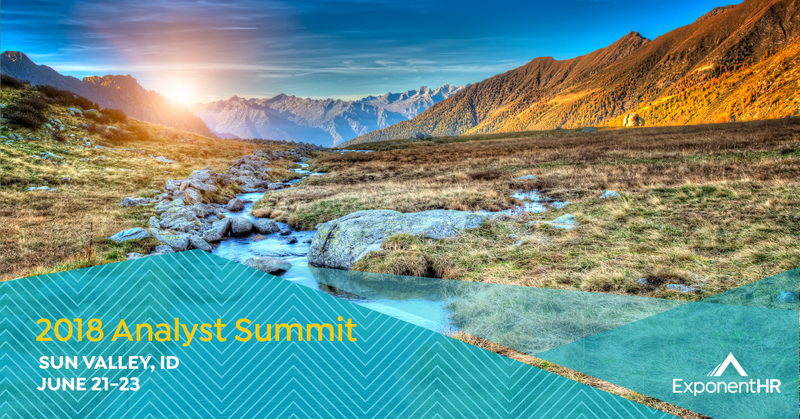 If you’re a human capital management professional who would like to learn more about our Summits or receive a summary of the analyst briefing, contact Meg Gardner. Never miss an event by subscribing to our newsletter to receive the latest news, exclusive events, and more from ExponentHR.